This one has always been a favourite of mine (it being my very first festival location). 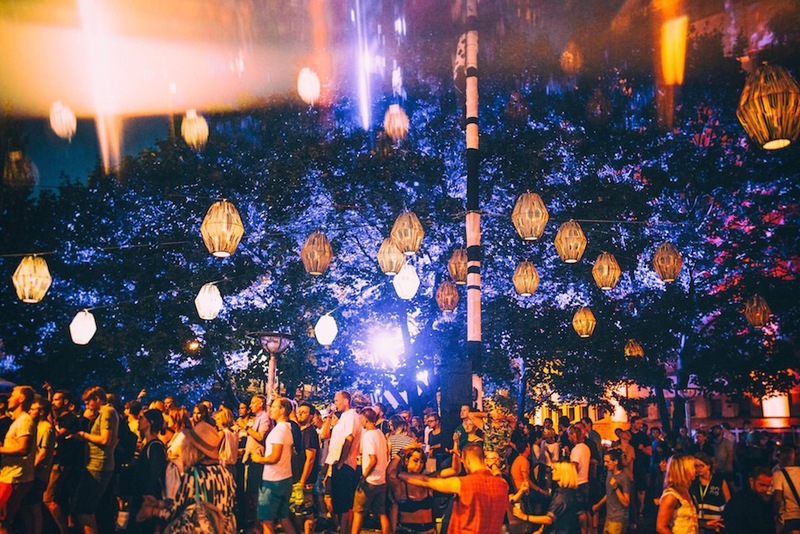 Latitude serves up good wholesome family fun year on year and they always manage to select a choice few newbies to spice the weekend up a bit. If it’s a chilled one you’re after, and you wouldn’t mind adding some new bands to your playlists, then head on East to Sussex to groove at a festival that has welcomed the likes of Bon Iver, Laura Marling and Bloc Party in the past. Where: Henham Park, Southwold, Suffolk. About 2 and a half hours drive from London and a 2 hour train from Liverpool Street Station to Diss. Big Names: The Maccabees make their return. Their new album delivers some rock ‘n’ roll jams and if their recent reviews are anything to go by, they should shred some serious stage. MO will be there, and as you will know, we LOVE MO. Also making a big splash are the bonkers John Grant and the equally bonkers but also deeply insightful, Father John Misty. I have so much time for a bit of Father John and his appearance on the English festival scene could not be more welcome. Daughter also makes a come back to the festival I’m sure they have a secret soft spot for. Saw them here in 2012 and their haunting music charmed my socks off. Eclectic picks: Loyle Carner! My main man! Massive massive massive fan of his. The fact that he hasn’t released much music at all makes his appearance on the circuit mindblowing. A live show will give everyone the opportunity to hear what I’m sure is breathtaking new stuff. I would probably buy a ticket just to see him. The critically acclaimed Michael Kiwanuka will also be crooning his sweet sweet croons for your listening pleasure. His new releases are very exciting and have strong retro feels. You could listen to his voice for days and not get bored. Smooth as a pair of freshly shaved legs. Reggie Watts is also coming! If you haven’t seen this, or this, do so immediately. Price: Things have gotten much much steeper since my day. £205.50 will get you there for the weekend, and around £80 will get you there for the day. Personally, I don’t think it’s worth going for the day. You will not get the real experience and for that price, you may as well make a holiday of it. All in all: Fabulous line up for those alt lovers among us, plus you have the added benefit of sleeping in the knowledge that this festival is not teeming with drug riddled 16 year olds making a ruckus. If its your first festival, or you’re bored with the same old Reading and Glasto vibes, get out there and try something new. If you don’t mind a trip out to the Isle of Wight, you will want to check out this kooky festival. The vibe is that nothing is too weird or over-the-top to exist as a side piece. Described as “the Noel Fielding’s Luxury Comedy of festivals” by the Guardian, you shouldn’t be surprised to see a bunch of drunkards reciting Shakespeare, a 30-foot toy robot flanked by troupes of pandas and human cockerels (whatever they are). I think their line ups can be a bit meh but if you’re after the experience, and you don’t want to follow the predictable Secret Garden Party bunch, this might be the one for you. Where: The Isle of Wight. It’s a 2 hour drive and a 1 and a half hour train journey (from Clapham Junction) to Portsmouth and anything from a 10 to 50 minute ferry depending on which company you book with. This is a big downside for a lot of people. I’ve heard many a horror story about travel in and out of the festival so I would plan way ahead and don’t expect it to be easy breezy. Big names: Not blown away by the line up to be honest with you. The Cure is obviously massive and I’ve heard you really get your value for money with them (sets have been known to go on for four hours in the past). This could be your chance to delve into rock history and witness the wildly eccentric Robert Smith do his thang. Years and Years also feature, which could be a big one. Other than that the only supposed ‘Big Names’ left are Major Lazer (if that’s your thing). Eclectic picks: Loyle Carner and MO both reappear mercifully. Also coming out of the woodwork is Ghostpoet, favourite of the people over at Mercury Music. His first album, ‘Peanut Butter Blues and Melancholy Jam’ introduced his drawling voice delivering arresting poetry over weird electronic beats. I grooved to it heavily and found it incredibly moving. His new album moves into alt-rock territory but maintains the thoughtfulness of previous work. Wolf Alice will also be there. Punky female-fronted rock, they would provide a good opportunity for head banging. Price: Weekend tickets are currently £190, which makes it cheaper than both Reading and Glasto. All in all: If you’re in it for the party and the electric atmosphere, Bestival offers all that and more. If you like an extensive line up to choose from, this isn’t the place. Maybe you’re into DJs and dance music and you’d love nothing more than to dance the weekend away at Temple Island. Or maybe, like me, you’d rather a festival that doesn’t consider Major Lazer a headliner. I’ve included this one purely because of their incredible track record of picking out the most talented up and coming acts. It has featured the likes of D.I.D, Kate Tempest, Loyle Carner, Jack Garratt, Hozier, Alabama Shakes, Alt J and Lianne Le Havas. (I could go on). It’s in Brighton and is a multi-venue job. In my experience, these are great. Not your typical festival obviously but you definitely get your value for money and it’s a chance to check out the hipness Brighton has to offer. When: 19th-21st of May. QUICK GET YOUR TICKET NOW ITS SO SOON. Where: Brighton. Takes under an hour by train from London Victoria and around an hour to drive. Names you’ll recognise: Their website is exceedingly confusing but from what I can gather: Mabel, Michael Kiwanuka and Loyle Carner. All big names in the Cowbell world, and all worth the trip to Brighton. However, my feeling is that this festival isn’t about which acts you know but which acts you will know come the end of the weekend. You will officially be the coolest cat in every music circle and you’ll probably be the smug I-saw-them-first guy in a couple of months/years as well. Price: For access to all shows for three days it’s £65.50. Hell to the yeah. However, you have to factor in a place to stay as well. You can get Air BnBs for £20-£40 a night and there a plenty of hostels (but BOOK NOW). All in all: For the avid music fans amongst you. If you’re excited about new talent and want to expand your horizons, get booking QUICKLY!! The first of our European picks, NOS alive is a big big festival. It popped up on my radar totally out of the blue but it kind of seems like this festival was created for me and people exactly like me. I have it on good authority that Lisbon “is a vibrant up-and-coming city” and it’s one that people often miss out on the classic euro-railing trip. Where: Lisbon, Portugal. Follow this likeroo for places to stay. There are camping spots for as low as £17 a night. Not too shabby if you ask me. Big names: Pixies!! Whaaaattt?! Everyone’s favourite 90s punk band return. Words need not even be said. Radiohead, another retro diamond. Their extensive work is like an ode to the awkward in us all. It’s dark, intelligent and emotional, weaving together rock and electro masterfully. Arcade Fire are also gonna be there. You know how much we love the Fire, in all their kookiness. Their live act is usually breathtaking, with Win and Regine flexing their fantastical stage presence like the beautiful weirdos that they are. The stage is cluttered with members and the costume is as eccentric as the tunage. Foals will also be electrifying the audience with their moody melodies. Eclectic picks: Father John Misty, John Grant, Years and Years and Wolf Alice. Also Tame Impala, whose psychedelic tunes have been rocking people’s socks off since their very inception. Two Door Cinema Club, who have been laying pretty low recently, will also grace the stage. Finally, Jose Gonzalez, whose soft tones and increasingly experimental production have made him a big mover and shaker in the alternative sphere. Price: At £119 for three days, it’s not too bad at all and if you manage to nab cheap camping spots it won’t break the bank. However, you’ve got to take into account the flights as well which are getting up there in price. BOOK NOW OR FOREVER HOLD YOUR PEACE. All in all: There is no doubt about it- this is the best festival line up for Cowbellites. It may be the best festival line up in years. If Rock is your thing and you’d like to live it up on the sunny shores of Portugal, then join me and my brethren for the most unexpectedly awesome event of the season. This is pretty much the budget alternative to NOS alive, with a pretty equivocal tasty line up. With the beautiful Basque country as your back drop and the crazy friendly Spanish to keep you company, you can get the traditional festival experience with pretty much guaranteed sunny weather. Yes pleeeaaasee. Where: Bilbao, Spain. Cheeky tip: if you fly to Biarritz, return flights can be as cheap as £75. You heard it here first people. The train from there is about £2.20 and take about 2 and a half hours. Price: The weekend with camping is £100.50. If you get a cheap flight you’re laughing. All in all: Sunny skies and groovy music off the beaten track. It’s a little festival with only a couple of stages but with the beautiful Basque surrounding you, you won’t feel guilty about strolling down the streets of the old town being cultural and such like. Whichever festival you choose, whether it’s for the music or just to get shitfaced with your mates, make sure you make the most of it. Don’t get caught up in waiting around for people as you try desperately to get phone signal. If you loose your crowd- don’t sweat (maybe it’s time to make a new crowd). Don’t be a whiner either. Nobody likes whiners. If someone spills beer down your perfectly coordinated outfit, laugh it off. If someone elbows you to get closer to the stage, accept that they’re probably a bigger fan than you. Let your hair down and groove, that’s why festivals were invented.